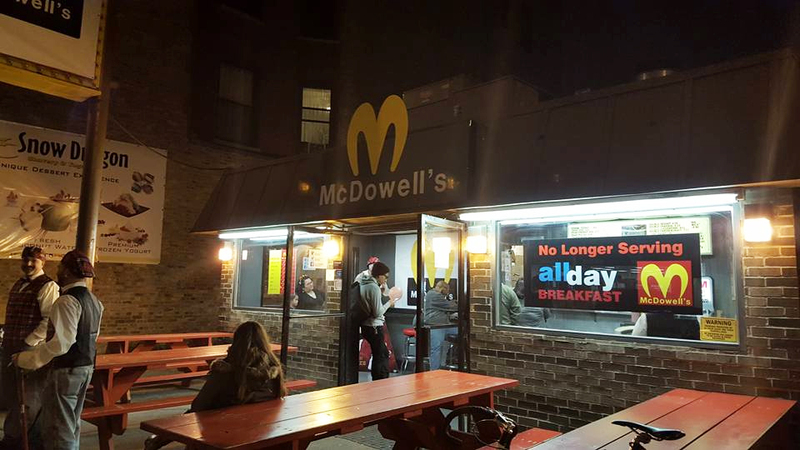 Sexual Chocolate may not have been on hand to play the opening celebration, but McDowell's still came to life in style this week—albeit a bit outside of Queens. Chicago's Wiener's Circle, known for its sassy back-and-forth between late-night customers and staff, has decorated for Halloween as McDowell's, the fictional hamburger chain where Prince Hakeem (Eddie Murphy) and his friend Semmi (Arsenio Hall) find work in 1988's Coming to America. The Wiener's Circle staff dressed in McDowell's signature plaid uniforms and decorated the restaurant with signs advertising the Big Mick hamburger (no sesame seeds, of course), Soul Glo and employee of the month Maurice (Louie Anderson). Check out this photo gallery from ecstatic visitor Kisa Marx to see how it all looked. According to DNAinfo, general manager Scott Brooker said the idea was brought to life by five local investors who recently bought the 33-year-old restaurant. "The new owners are big fans of shock value," Brooker told DNAinfo. "With McDonald's across the street, it was perfect." Hat tip to Pervaiz Shallwani via Facebook.